Read the Nissan Pathfinder 4x4 (2005 - ) car review by Auto Trader's motoring experts, covering price, specification, running costs, practicality, safety and how it drives. Rugged, full-sized off-road 4x4 offers a no-nonsense alternative to luxury 4x4s such as the Land Rover Discovery. Interested in buying a Nissan Pathfinder? The Nissan Pathfinder replaces conventional good looks with an air of ruggedness. It shares plenty of design cues with the Nissan X-Trail but it’s the Navara pickup with which it looks most similar, so it inherits the load lugger’s bold chrome grille, square headlights and a boxy, Tonka toy-like look. The interior lacks the flair of more upmarket 4×4s, but that fits with its straight-talking image. The plain dash features a colour screen which is clear, although fiddly to operate. The lower part of the centre console is uncluttered, and has a trio of cupholders, a huge storage box between the seats and the passenger has easy access to two gloveboxes. Higher spec models feature comfortable leather seats but there is rather too much grey plastic. The Nissan Pathfinder has seven seats, although the two rearmost are quite small. There’s plenty of room for five adults, and the rear seats fold flat into the floor to create a huge 515 litres of room. The second row of seats fold in a 40:20:40 configuration to expand the boot to a massive 2,091 litres. The tailgate opens vertically, which allows excellent access to the boot and an opening glass tailgate is fitted as standard. With obvious off-road talents, the Nissan Pathfinder is compromised on the tarmac. It leans through bends and the steering offers little feedback. There is plenty of grip, and the driver can select between rear-wheel drive and four-wheel drive in both low and high ratios. 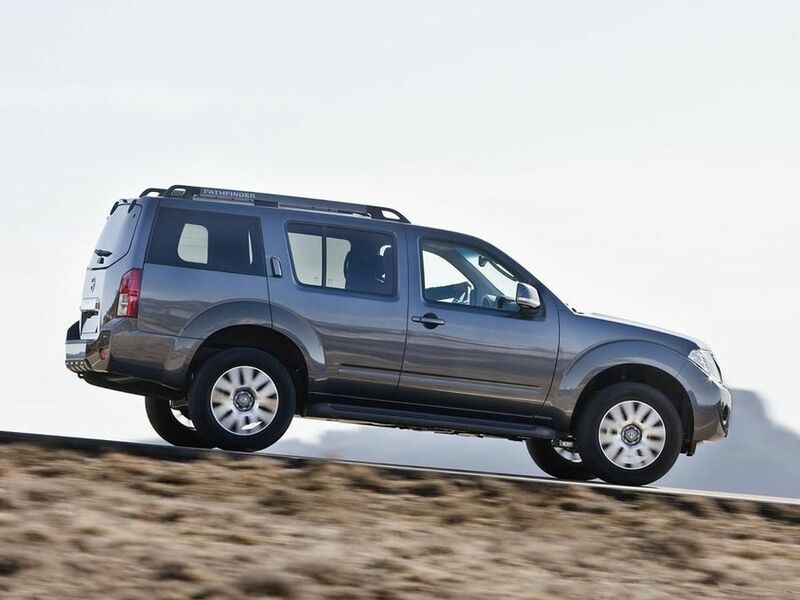 The Nissan Pathfinder can be fitted with hill hold to prevent the car rolling backwards during hill starts. Rivals such as the Mitsubishi Shogun and Toyota Land Cruiser are more pleasant to drive. The Nissan Pathfinder is fitted with a 2.5-litre diesel engine developing 187bhp and an impressive 332lb/ft of pulling power, which means it’s capable of towing up to three tonnes. The manual Pathfinder can reach 62mph in 11 seconds before reaching 115mph (the auto is marginally quicker to 62mph). The trade-off for all this grunt is poor refinement – the engine is gruff at tickover as well as at speed and there’s a great deal of vibration in the cabin. With a starting price of £28,500, the Nissan Pathfinder undercuts many of its rivals, although used values aren’t quite as strong as more luxurious, upmarket 4×4s. An average fuel consumption figure of 33.2mpg is better than some others, although will still prove expensive to run. Insurance groups are competitive for a seven seat SUV, but emissions of 264g/km means the Pathfinder will be expensive to tax. The Nissan Pathfinder appears to be mechanically tough, but our test car had niggling faults with the electric door mirrors not retracting properly and the plastic key (which replaces the conventional ignition key slot) jamming when the steering lock is activated. The Nissan Pathfinder scored four out of five stars in the EuroNCAP crash test programme shortly after its 2005 launch. It comes with driver, passenger, front side and curtain airbags as standard, along with whiplash-reducing front headrests, anti-lock brakes with electronic stability control and hill start and descent assistance. Two models are available: Acenta and Tekna and both are well equipped as standard. Both feature dual-zone climate control, seven seats and electric windows and mirrors, while the Tekna adds a rear parking camera with colour screen, rear climate control, leather upholstery, Bluetooth telephone integration, a hard drive-based sat-nav and music server, DVD player and iPod connectivity. The Nissan Pathfinder looks and feels every inch the tough off roader. It feels mechanically tough, and appears to have genuine off-road talent.